I call that secession. Let's make it legal. We'll take the African Americans they love to abuse! Deal? win win! i just read that they are thinking of breaking calif into several states. i wonder what plates and flags and flowers and animals they would use for the different states. The confederate flag represents slavery, racism, and oppression. It should be banned as a disgrace to the country! It's a specialty plate, if you don't like it don't purchase one. Arielle is right, but they can do what they want. But they need to understand that unfortunately people take out their feelings by keying cars and popping tires, or worse. So put one of these on your vehicle at your own risk. 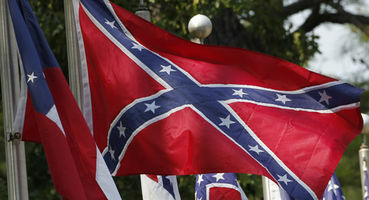 The Confederacy is part and parcel of all the political problems in America since it was disolved in 1865 the Confederacy was blatantly repressive and authoritarian, with almost all political power held by the plantation-owning plutocracy and much of the country under strict martial law. The Confederacy was a dangerously unstable nation when it existed and the delusions of the South will rise again has more to do with the Southern strategy than historical fact and a healthy dose of racism to boot. Back in the 80s, working at the track, there was an old, angry piss ant, around the corner that was stuck on the south rising again. He HATED Yankees. This mind set is their meme. They will never go away because they are raised that way. None of your flags are appropriate to fly anywhere in the region. In 1831, Cherokee, Chickasaw, Choctaw, Muscogee Creek, and Seminole were living as autonomous nations in what would be called the American Deep South. In spite of the assistance they gave to the US in 1812-1814 , US prez Andy Jackson - betraying those who saved his life and gave him a place in your history) and the US legislature created and implemented a law which forced them away from their homes , and they had to walk to the arid prairies of what is now Oklahoma - most of which was also later taken from them, and had been taken, of course, from the peoples and other animals indigenous there. The mentioned tribes had even changed their lifestyles and were regarded as contributors to the US and states' economies, and had been until that date recognized as sovereign nations. Then in yet another corrupt ruling by the US supreme court (no, the garbage they spew giving and taking rights as persons [everything not a person in US law is a possession] - giving to for-profit corporations, and taking from all else), in 1831 this status was denied, although even Georgie Wash et al. recognized their rights. Your flags, which i was once tossed out of 8th grade for refusing to seig heil/worship to, have no right but evil violence upholding them. I believe that flag was a battle flag. The Confederate States flag was first that symbol on a white background before that symbol was ever adopted as a stand alone battle flag. It represented white supremacy over all other colors of people. Unless people from the South feel that is an appropriate heritage to embrace, they should reject it. Keeping alive the pain of the past only keeps the brightness of the future dim. Michael M. You're preaching to the choir, bro. I guess they are proud of all the evil they committed with slavery, turning on their Native American allies, etc. If that is their idea of glory days-well-they deserve to be ridiculed. Looking at the bright side.... the rest of us will know who they are and we can avoid them. Unbelievable. This is stupid and even if it is a "specialty" plate it shouldn't be and it is disgusting and despicable in this day and age that the people in power thought this was acceptable. They need serious mental health counseling and to be removed from their jobs. I really hope the younger generation is as repulsed by this as people are in other states and in their own state. Who ever thought of this was living with ET and Peter Pan in Never, Never Land. Do you know what any of the symbolism of the "confederate flag" means? Red, White, and Blue same as our current flag. With stars same as our current flag. 13 stars representing the original 13 independent colonies. Independent until the Union came along and wanted strong central government with no rights for the states. The same kind of government that is leading to our current trampling of citizens rights and abuses of power that are now rampant in our police state government. These are the same reasons that the south broke away from the north. Lincoln was the first president to do away with habeas corpus protecting against unlawful detention does this sound familiar? Guantanamo bay anyone? Yep Lincoln was the first to do away with the right to a fair trial. The countries that lose in battle are always treated like this. I wonder what propaganda King George would be spreading about the 13 traitor terrorist colonies if the US had lost. The south was fighting for independence and survival. The war was waged on southern soil against northern invaders. They were not perfect. I believe that slavery was already on the way out with the invention of the cotton gin. Lincoln only outlawed slavery in the states that fought against the US. Slavery was continued in the border states for several years after the civil war ended. It is a fact look it up. Blacks were not treated decent until the 60's. Thanks Carrie for sharing this. Thanks for sharing Carrie. My. my, Georgia has been in the news lately. With this flag and the new gun laws they put through (or are trying to). for guns in churches, schools, and everywhere else you can think of. With this, I am sure there will be a lot of victims of the violence of these guns. Jamie, it's about what it means to the southern people today. They truly believe they will rise again. I say, hand it all back, take in, who they would make slaves and be done with the whole lot of them. Why don't they jusy change the State Seal to a burning cross and get it over with? Why not? It is a very important part of the history of the South. It is important that, like the Holocaust, the battles must not be forgotten. If you don't like it, don't put the plate on your car. Find a plain one. Deb E, are you saying they are so dumb they don't even know what their own flag really looked like? Thanks for the trenchant comments, Arielle, Carrie and Louise, and thanks to Carrie for posting. Just another reason to never go there. This is a throw it in your face action and another reason to never visit the state. Where are the good people of Georgia? Are you willing to accept this action of state government? Approval of a confederate flag on a license plate? How are you representing all of the people of Georgia by doing this? I guess you want people to believe you are racists and bigots. Bring back the peaches as a symbol. Everyone eats peaches, not everyone can swallow the idea of being labeled a bigot or a racist. Noted, tweeted. I was trying to figure out how I wanted to comment; i'm a transplanted Yankee and always turned off by Confederate flags on local (FL) pickup trucks. But what I want to say is how impressed I am by the variety of comments of care2ers. It is pretty amazing, if you think about it, that folks of a wide variety of opinions can freely post them on the same article. Thanks to everybody who commented; add to that how much I enjoy also, as an American, reading comments from care2ers outside of America. Thanks! Oh geez, let them have it! I cannot think of anything better than letting people self-label themselves as crazy, narrow-minded ignorant racists. It is a bit like announcing " I'm a bigot let me offend you" I think a tattoo on the forehead would be a nice warning. Makes it easier to avoid them. I agree with Syd H.
One in 25 people are sociopaths. Confederate heritage was bases on racial oppression. The argument doesn't make sense.